After today's strong action, action which will surely make bears think "this has been a corrective wave that's now finished", the market internals data continues to strengthen, adding to the argument for perhaps more upside than most are envisioning. Please don't misunderstand, I'm still as bearish as ever but have come to appreciate the wisdom in "just forgetting what I know" and focusing on "what I see". And what we're seeing today, augmenting the signal from the weekly NYMO which I detailed here, is more strength as it has become apparent that the NYSI (a derivative of NYMO which tends to lag by a day or three) is now issuing a buy signal as well. I know, I know... how could a person possibly see anything bullish in today's market? Especially someone like yours truly who has been afflicted with the disease known as "bearish bias" since the 1970s? But it is what it is. I'm just reporting what I'm seeing here friends and what I'm seeing is that deep inside the market, hidden from normal view, there are more stocks willing to participate in upside than there were last week. That's not to say that the market internals "aren't weak"... they are. But they are also at levels where market lows often occur. And they are improving... faster with each day. Normally my nose isn't this red. Pressure... you know? I don't want to speculate on what is giving the market this strength. I don't want to know whether or not it's a short squeeze, a squeeze that could possibly get much more excruciating overnight. I don't particularly care any more whether or not it's another deliberate 'goose job'. A ramp job that put the market into a condition where bears will surely recognize the potential for a beautiful looking H&S pattern that 'must surely fail because it's textbook'. I can certainly see that potential H&S as well. It's a beauty alright, but until any H&S is actually completed with the breaking of the neckline, it's just that... pure conjecture. Fortunately, of all the pattern 'traps' that are possible, that is one I've never been caught by for the simple reason that for some reason or other I've always been overtly aware of how often a potential H&S just seems to vanish into the waves as time progresses. Today I'd like to show the daily chart of the Summation Index for the NYSE. Just as a matter of explanation, NYSI is actually derived from the McClellan Oscillator. To plagiarize the excellent description as detailed by StockCharts, the "McClellan Summation Index is a breadth indicator derived the McClellan Oscillator, which is a breadth indicator based on Net Advances (advancing issues less declining issues). 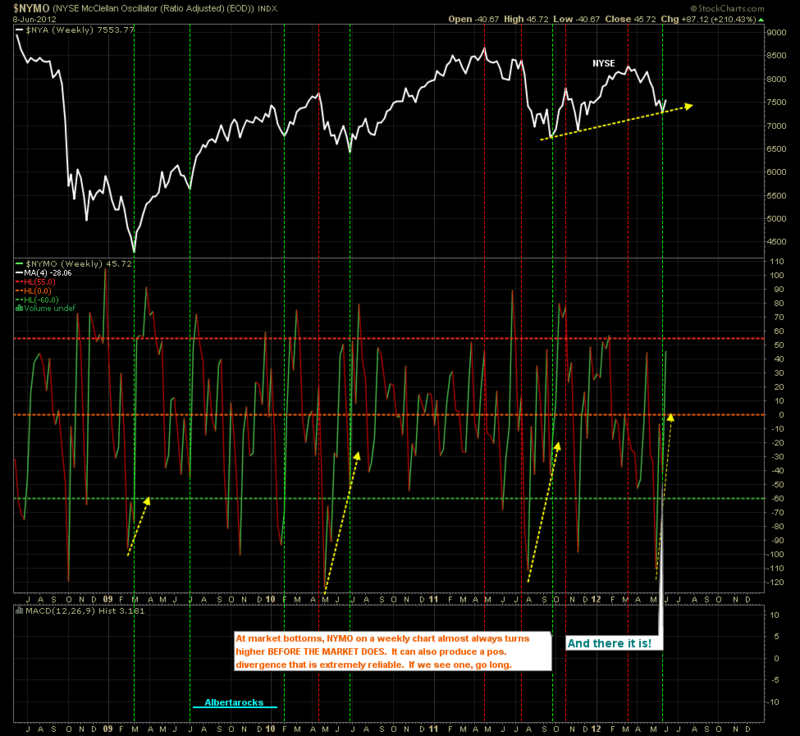 The Summation Index is simply a running total of the McClellan Oscillator values. 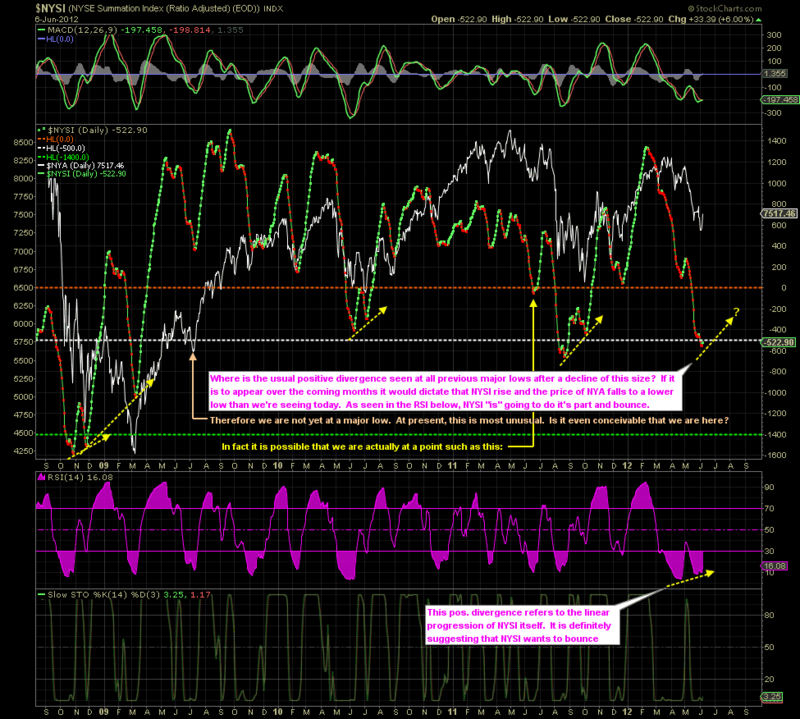 Even though it is called a Summation Index, the indicator is really an oscillator that fluctuates above/below zero. 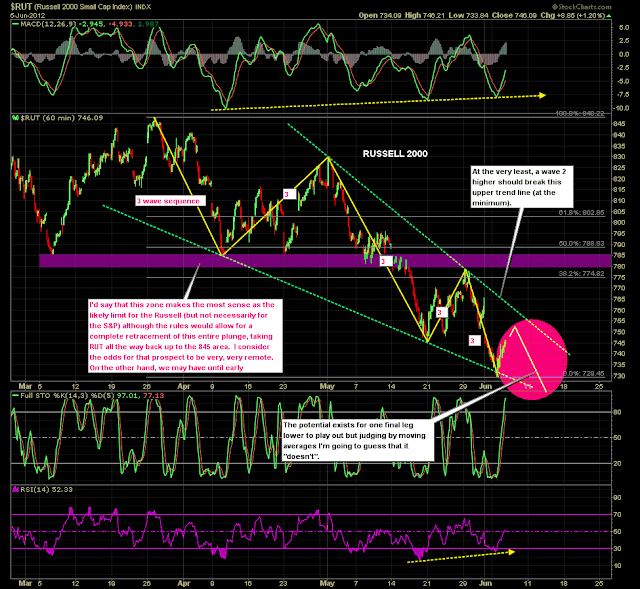 As such, signals can be derived from bullish/bearish divergences, directional movement and center line crossovers". NYSI Daily - Click here for a full blown version that includes several indicators not visible in the version above. To add to the evidence, let's also revisit that signal which we alluded to in Sunday's post, "NYMO Weekly Issues Buy Signal". So the evidence mounts that the market appears to be gaining some internal strength. In no way does that imply "how much" strength though, nor how far it intends to climb. I think it's just a simple matter of the market perhaps having fallen "too far, too fast". 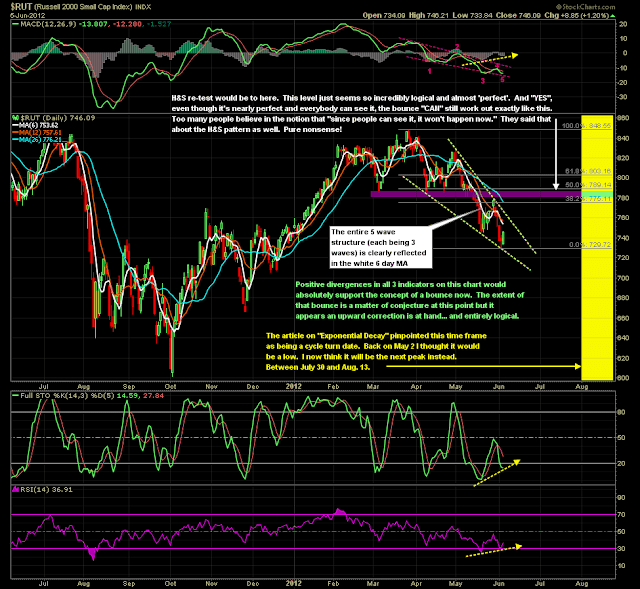 And from that perspective a bounce is absolutely warranted. Nobody should be surprised by it nor particularly angry about it. I don't pretend to know how far it will bounce but suffice it to say that according to Elliott Wave rules, this bounce could indeed retrace the entire decline off the April 2nd high. In no way would I suggest that's what's in the cards though. 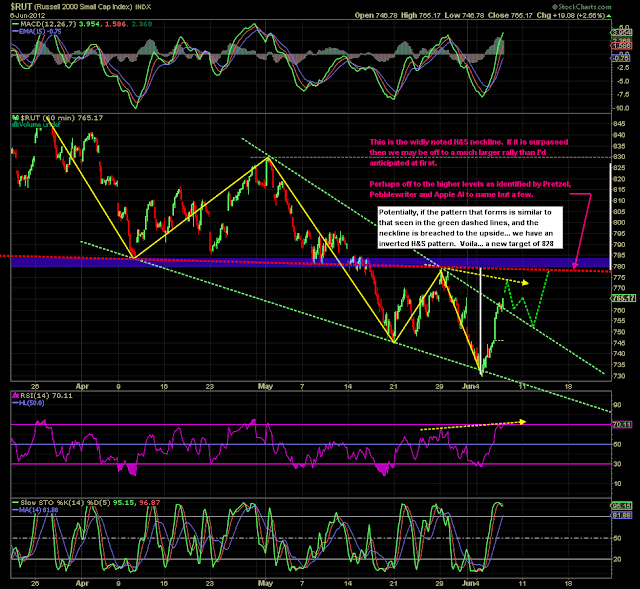 In fact, my personal gut feel is that a retracement of perhaps 61.8% would be perfectly normal. That would take the S&P back up to the range of 1360-65 and that's exactly what I think would make the most sense since solid resistance resides right in that area. First though, we need to see if the markets actually do what these indicators are suggesting they will do... rise! I think this evening's overnight action on the futures markets could end up being one of the more important sessions in this entire month. CONCLUSION: The market is showing that it wants to rise. In the event that's what happens, what we must then quickly get focused on would be a reversal of the signals discussed above. Because if these indicators at some point start to warn of a pending top, and that top is going to be lower than the April high (which it surely will I would have to think), the bears are most likely going to get one of the best entry points they're likely to see in a year of trading. There will be others, but the one I'm referring to is one we don't want to miss out on. Stay tuned, it seems the market action just might be developing quite logically. What a nice change of pace that would be. Just for the heck of it I thought I'd throw this chart out there. Normally when we see a chart like this our first inclination would be to give an honest assessment of what we think the next move is. It's an especially effective exercise when we don't know what the stock, commodity or product is. I've drawn in my own opinion about where it's heading next but please don't let that affect your own vision because I'm just making an educated guess like anyone else. Where would you say this pattern is going next? 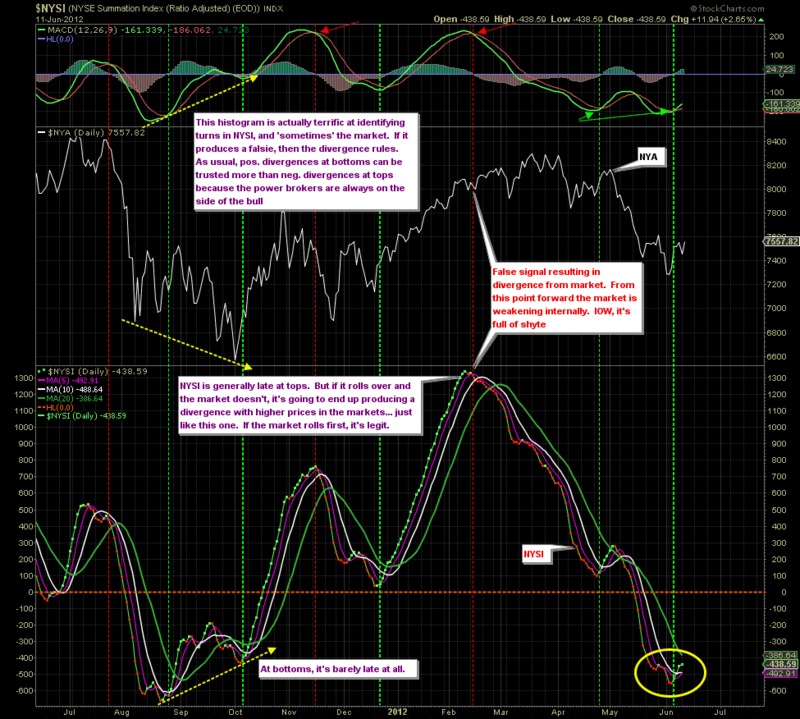 Market internals have recently been showing signs of bottoming which would of course imply a bounce of some sort. However, until the improvement in those market internals showed a bit more 'conviction', their signal had not been convincing enough for my liking. Nonetheless, once they became more developed it became apparent that it's entirely possible, considering that they're emerging from levels where bottoms often occur, that they are signaling more than just a small bounce. At this early stage the size of the coming move higher is difficult to ascertain but it seems that something significant could be in the works. From this point forward we'd defer to other methods of measurement to try to get a sense about the power and duration behind this 'bounce'. Well whataya know? For the first time in a long while I can finally stick my neck out there and say that I can see a bullish looking chart that even I can buy into. Me, the one person who is tormented above all others with a bearish bias so powerful that I can't even read my own TA work properly half the time. Well in fairness I should probably say that "I can read it alright, but I can't believe that what I'm seeing is even possible sometimes". As difficult as it is to completely ignore the fact (at least for me personally) that Europe is on the verge of a complete meltdown, the global power brokers seem to be up to their old tricks and just might be able to temporarily reflate the equities markets one more time. Of course the entire world realizes that it will just be another in a long list of failed attempts to stop the motor in the torpedo that's well on its way, but for now it looks like they just might be able to stall the big hit for a wee bit longer. "We hope to have video on the torpedo attack later in the news hour. And now... back to our regularly scheduled programming..."
RUT 60 min - Click here for a live and updating version. 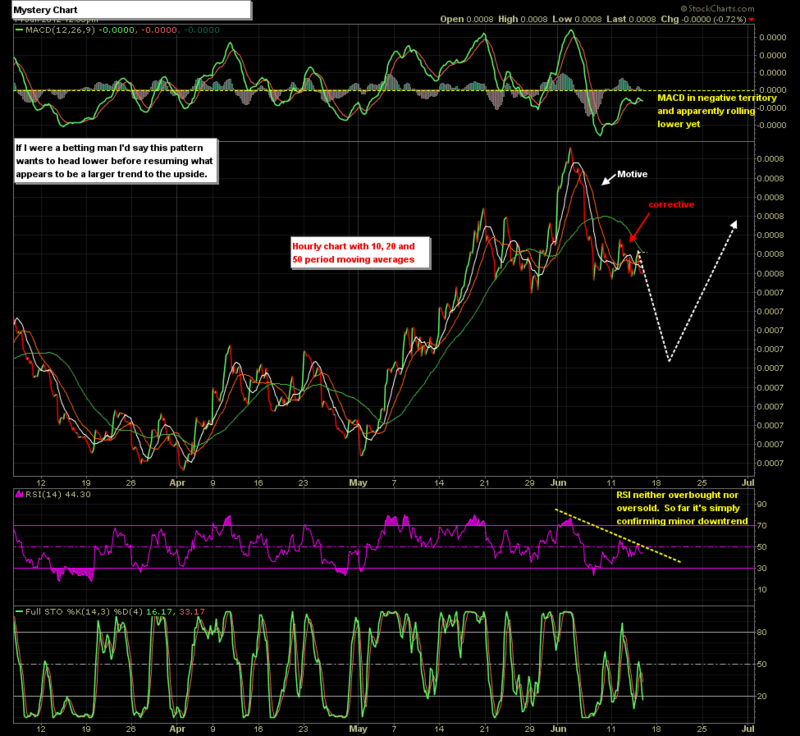 For those not subscribed to StockCharts... here's the print version so you can see the annotations. I want to start off with the 60 minute chart (above) because it's on that chart where I finally had the epiphany I was looking for. Why didn't I see this sooner? In retrospect, I can say that Pretzel had pointed out that the first wave down off the high (yellow wave 1 in the chart above) has bothered him from the beginning because it looks like a 3 wave structure when others counted it as a fiver. In fairness to all, it can be counted either way. But to my eye, it's a 3 wave structure and even though I had read Pretzel's admonition it didn't really sink in. Until now! Because dang it all, not only is that first wave a 3 wave structure... all five yellow waves above are 3 wave structures. The whole thing appears to be a leading diagonal (without the required overlap)! Is such a structure legitimate in EW Theory? I don't think so, but darn it all each and every one of those waves is a 3 wave structure and even though the overlap between waves 1 and 4 did not occur, that's still a motive wave. That's my story and I'm sticking to it. 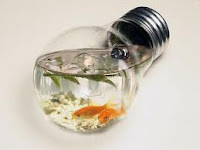 An embarrassingly late light bulb moment. The only caveat I'll throw in here is that in these wee hours of the morning I'm not totally convinced that the fifth and final 3-wave leg lower is complete. For one thing, the ideal target for the H&S has not yet been met. Although it doesn't have to be met, it usually is. A bit of a conundrum. We'll have to see how the market reacts to a huge gap higher this morning (Wednesday morning). If it's going to pull back and get started on that final push lower to complete that last 3 wave, we'll likely see it begin quite quickly. So although Pretzel wasn't entirely sure, at least he identified the possibility above. Cudos to Pretzel! I certainly did not discount his warning, but nether did I pay enough attention to it. But wait a minute... I'm not going to beat myself up about this. In fact, I'll answer my own question. I failed to recognize that the entire decline from the end of March was a diagonal because just like almost every other Elliott Wave practitioner out there, we're fixated on identifying 5 wave structures. And we do that because 5 wave structures represent the hallmark of EW theory... a motive wave... an impulse. 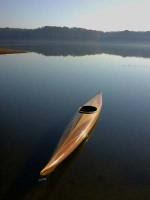 It's by identifying 5 wave thrusts that Elliotticians navigate in extremely difficult-to-chart waters. So by focusing so mightily on identifying fivers, I like most other technicians, too often fail to see a 3 wave structure when it's right there staring us in the face. Even after Pretzel (correctly) identifies one that he envisions to possibly be a 3 wave sequence, lol. But for me to miss 5 of them in a row? I'm going to blame that on the failure of waves 1 and 4 to overlap. No doubt that threw not only myself off the trail, but must have surely thrown even the best EW specialists off the scent as well. We have a normal (but probably unhealthy) tendency to insist on seeing fivers when they may not even exist at all. 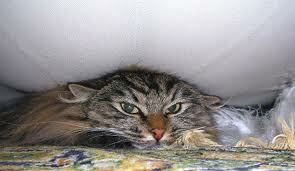 Nonetheless, I think I'll just slip under this rock now if you don't mind. But alas... it's early in the game and nothing is lost. In fact I think new vision is found. Click here for a live and updating version. We'll know real soon whether or not these targets are nothing more than whimsy or a little more real than that. For now at least, it's just a bit too interesting to dismiss outright. Although the analysis I'm presenting today appears to be in defiance of that shown in the May 2 piece on Exponential Decay, we can still use the cyclical portion of that study as shown in the chart above. 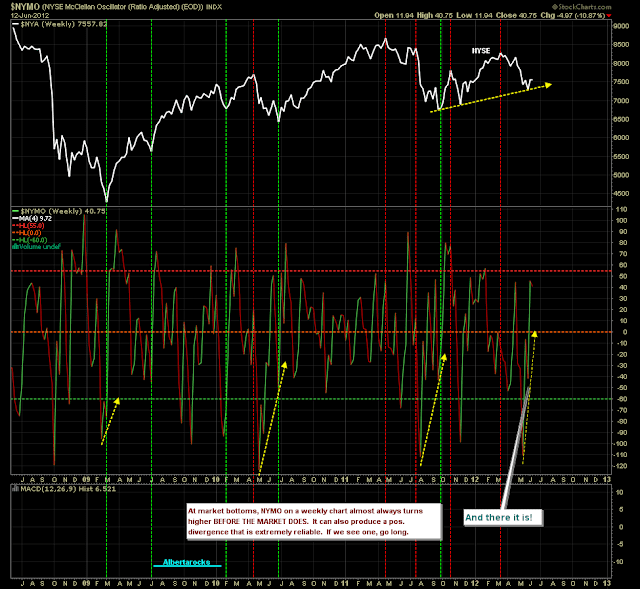 As you can see, the yellow cycle dates are still as valid today as they were a month ago. 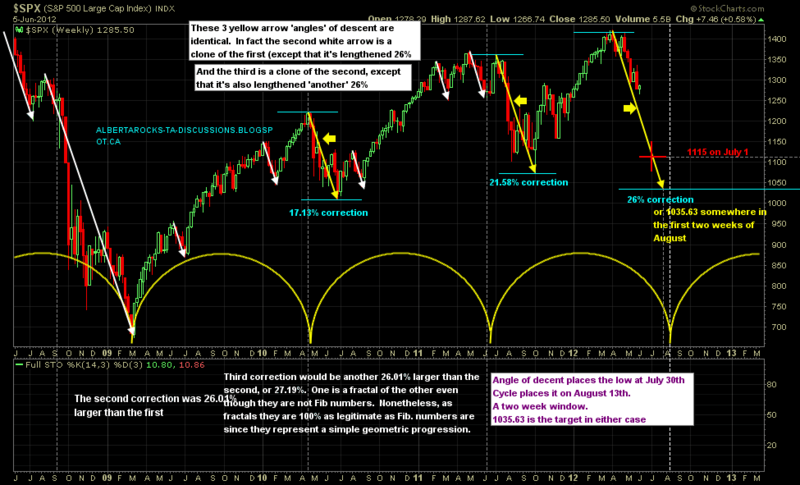 They still indicate that an important turning point in the markets should occur in the first week of August. As I'd mentioned in the previously-referred-to article, we can't necessarily tell by looking at a cycle study whether it's identifying a market 'high' for the first week of August... or a market 'low'. 5 weeks ago I thought early August would mark a low. Today I believe it is in fact pinpointing a market peak. Because not only is the Russell revealing what appears to be a completed (or nearly completed) 5 wave sequence lower, the market internals data are now beginning to reveal several positive divergences that suggest that they are more than willing cooperate with a sizable bounce in equities. So to the best of my knowledge, other than the fact that Rome is almost burning, all the ducks seem to be lined up for the markets to march higher. One more final thrust lower notwithstanding. Those freakin' bankers are just magical wizard bastards, are they not? Let's assume for the moment that the conclusion I've drawn is correct. If the market were to begin to blast off from here, the very minimum move we should expect would be that the upper trend line in the chart above be broken. More likely though, the neckline of the Head and Shoulders pattern is most likely the target. Personally, I doubt very much that that level will be exceeded. (I need to qualify that by pointing out that the Russell is likely to stall at the neckline and reverse from there, but not necessarily the S&P.) But it's possible that the Russel could exceed the neckline as well, since EWT would allow for the entirety of the move down off the March high to be retraced. Possible, but extremely unlikely in my opinion. On that note then, I need to mention a recent call by our friend Pebblewriter. I think most of you probably know who Pebble is but if not, he's a terrific technician who's expertise is in the field of Gartley Patterns. I don't know all that much about that field of study but Pebble has been kind enough to point out a couple of the nuances to me. I'm not good enough at (not nearly good enough) to quote any of it but I do know that Pebble eats a lot of butterflies and crabs. I'm not sure if that's a prerequisite to understanding what he knows but I ate a butterfly on Saturday and nothing happened. So I defer to Pebblewriter's expertise which led him to drop the following comment on the last post on this blog only two days ago (Monday, June 5th). ["Haven't quite reached a conclusion yet on a "new high", but the bounce should be substantial."] Pebblewriter, Monday June 5th, when calling that a low was in. In other words, it appears that Pebblewriter absolutely nailed the low. Even if there were to be one more thrust lower, his analysis would still be within a few days and judging by the size of the bounce that he has measured, it would be one heck of a great call. So friends, if you'd care to see more guidance about the potential for the size of this next bounce, Pebblewriter's blog offers a completely different (and often very accurate) way of looking at things. In his recent article entitled "SPX: The View from 30.000 Feet", Pebble gives a potential target that is surprisingly high... much higher than just a test of the neckline that I'm envisioning. But not for one second would I discount his vision. He's been far too accurate to dismiss. Not to mention that like many of the other bloggers that I've gotten to know, he's one of the nicest guys you could ever hope to meet up with. So is Pretzel... and at 6'4", I'm kinda glad Pretzel is one of the 'good guys' too. Ok, back to the daily chart above. Notice the bright yellow band on the right side of the chart. That band is identifying the potential cyclical turning dates discovered in the analysis on Exponential Decay. As faulty as that study may or may not have been, at least the cycle dates that it identified are still perfectly valid. One caveat I'd like to throw into the mix here: In each of the past 3 years, an important market turning point has occurred on (or very near to) July 1st. A low in 2009, another low in 2010 and a peak in 2011. Just food for thought and it's very important that we keep that in mind as we near the end of June this year. At this point I had planned on inserting some charts that show how the market internals data is now set up to staunchly support a bounce in equities. But that can wait until later this week and I will do just that... add some charts as those indicators (lagging indicators) begin to make the turns higher that I'm almost certain are coming. Those turns higher will be visible later this week and I'll add some of those charts at that time. So please feel free to bookmark this page and come back in a day or two for the updates. Oh... news flash! Just as a reminder... that torpedo is still on its way and it is absolutely, 100% guaranteed... unstoppable. Delay-able? Absolutely... but not for much longer. When it hits we're going to understand all too clearly, the meaning of "that sinking feeling". Well! As they say at Quicky's Cat House Express: "This won't take long, did it?" As mentioned in the main article above, the first order of the day would be for the indexes to break though their down-sloping resistance trend lines. They did that today with a flourish. Not only did they break out, but the rally was very broadly based with participation from all sectors and with very meaningful improvements in the horrid conditions of the market internals. In other words, this rally is very powerful. In reality, that doesn't necessarily equate to "long lasting". Nor does it mean the market is off toward new highs, although that too is possible. That aspect of it remains to be seen because let's face it... Bernanke could very easily slip a turd into this punchbowl. So in spite of the beautiful breadth of today's rally, it's still entirely possible that it's still just a natural reaction off a very dismal market internals situation. It could just as easily be powerful people taking advantage of a wonderful opportunity to offload their bags of toxic poo. 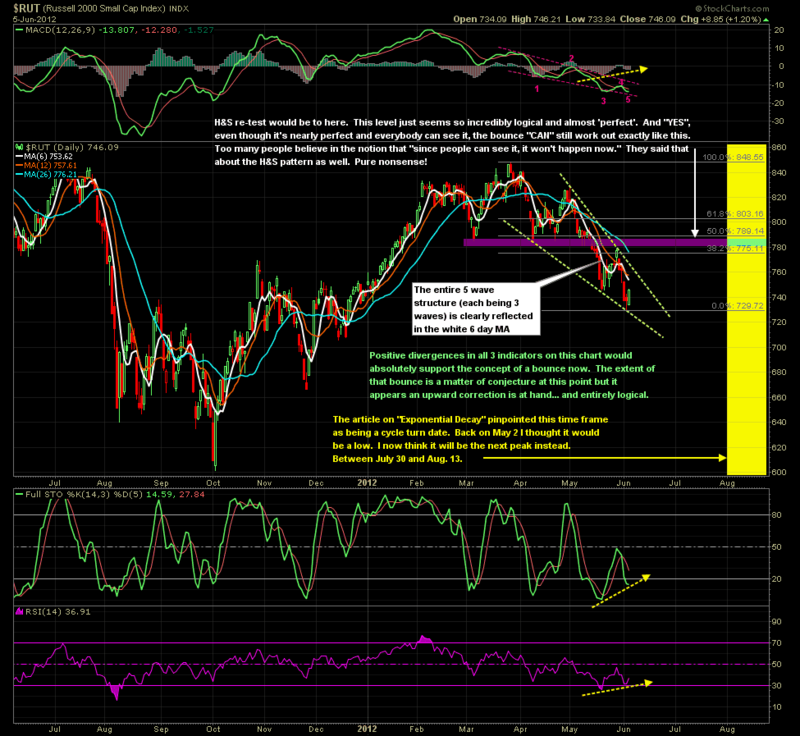 I know that sounds like my inherent bearish bias is acting up again... but what I say is not untrue. It's very true! These improvements in the market internals data could fizzle in a heartbeat and Ben controls that aspect... period. But in order to alleviate the pain my words will surely cause in the ears of those who are bullish, I will say this... if Bernanke says all the right things, I go as bullish as everybody else. Unfortunately, it depends entirely on what he announces... or fails to announce. Isn't that a sad state of affairs? So what next? As you may have already surmised I like to focus on the Russell, mainly because it's a leader. It tends to telegraph the moves in the S&P in both directions because it better reflects the actions of those who take bigger risks... the big boys. So now that the Russell has broken out, the next logical point of interest is unquestionably the level where the previous big H&S pattern's neckline intersects. That level is identified on the chart above and it resides in the area of 777 on the Russell. On the S&P it's not nearly as clear but in my estimation an equivalent would be the area between 1335-1340. I don't think there any chance whatsoever that the Russell won't hit that line at the very least. However, I really doubt that it can make it all the way in one fell swoop. I know, I know, the mood out there has suddenly turned uber-bullish. Rumor and jaw-boning by the likes of Janet Screamin tend to have that effect. But we have to be very realistic now, until Ben the Benevolent actually announces something monumental, it's just that... rumor and conjecture. Nonetheless, we have to put all that speculation aside and focus on what happens tomorrow when Mr. Bernanke actually puts on the performance. Perhaps the performance of a lifetime because wow... that one is a biggie. In a nutshell, here's what I think is absolutely critical... that neckline. Either it is going to be surpassed or it isn't. And that's it. There's no point in speculating on whether or not that happens, but there's definitely reason to examine each case. I doubt very much that the neckline will be tested in one straight charge and think it's more than reasonable to expect the pullback as shown on the chart above, BUT, if the neckline is tested and offers insurmountable resistance, we're going to see the Russell react first and probably very violently to the downside. Thankfully, more often that not, the re-test of a H&S neckline as beautiful as that one isn't usually a long drawn out affair. We should know fairly quickly. In other words, I highly doubt the markets are going to fool around there, knocking on the door 4 or 5 times. The world is just too damned edgy for that kind of messing around these days. On the other hand, it is definitely possible that the neckline fails to hold the Russell back. In that case, it's a whole new ballgame and the minimum upside targets then become measurable and substantial, with 828 on the Russell seen as a minimum. 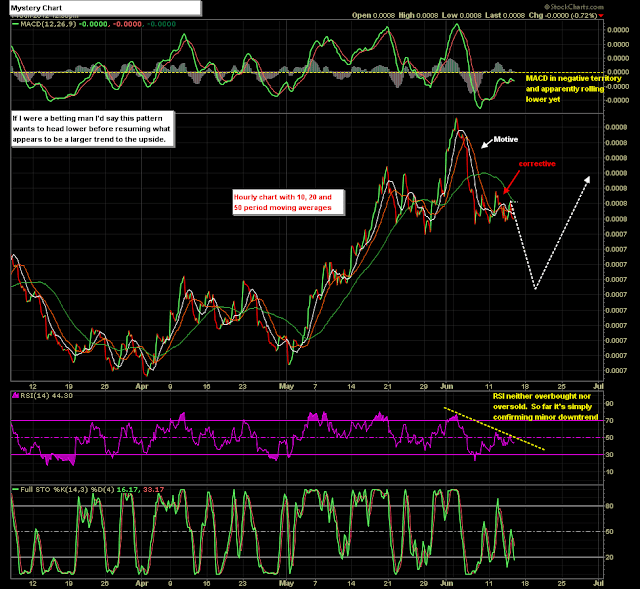 $NYSI Daily - Click here for a live and updating version. And that is in regard to the fact that the Summation Indexes almost always provide a very reliable divergence at major turning points. Witness the last 3 very important market bottoms; March 2009, June of 2010 and August of 2011. In all 3 cases the market had suffered a substantial decline, the smallest of which was in the summer of 2010 and which represented a drop of 17.9%. By comparison, the recent sell-off in the NYSE over the past 11 weeks was only 13.3%. So does the recent decline qualify as a major bottom? Perhaps not since in truth it might be just another 'run-of-the-mill market low'. It is equally possible though that perhaps there is more downside to come. I hate to sound negative but the lack of divergence dictates that this possibility is very real. Nonetheless the recent decline was a significant enough event that it brought the NYSI down to a level where market lows are often found. So where is that positive divergence? It raises the prospect that perhaps it is yet to come because it is expected although not absolutely mandatory. On the other hand, and this is a very noteworthy observation, although the NYSI has reached a level which is approximately equivalent to its level attained at the low of the previous (and scary) decline in the summer of last year, the stock markets actually have not. That fact alone can legitimately be interpreted as a very bullish signal for equities. So once again, as is so often the case, we find ourselves looking at a very valuable market indicator and it's flashing mixed signals. So in order not to leave you thinking "well that was barely worth reading", let me summarize it with these interpretations: The positive divergence is not absolutely mandatory although its absence is concerning. Other than that little "glitch", the Summation Index is definitely going to turn higher. That fact is flat out positive for the equities markets since it suggests they will turn higher as well. And the final clue (which I believe is the most positive aspect of all) is the fact that while NYSI is now at the same depth (close enough) as it was at the last major low, equities themselves are not. OVERALL... other than the missing positive divergence, these should be deemed as very bullish developments until and unless proven otherwise.